photographed from St Laurence's Church. The 2018 Ludlow English Song Weekend, artistic director Iain Burnside, takes Ireland as its theme for 2018. 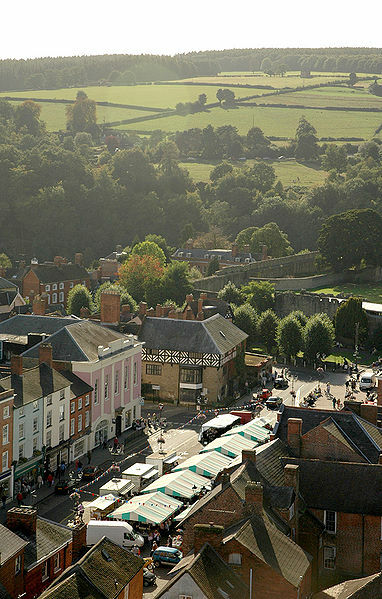 From 6 - 8 April 2018, the historic market town of Ludlow will be full of 20th and 21st century English (and Irish) song, with recitals, choral music, masterclasses, poetry, talks and discussions. Artists performing include four Irish singers, soprano Ailish Tynan, tenor Robin Tritschler, mezzo-soprano Carolyn Dobbin and baritone Gavan Ring, plus English baritone Gareth Brynmor John, and there is a masterclass with Irish mezzo-soprano Ann Murray and the Irish actress Fiona Shaw performs in an evening of words and music. Things start with Ailish Tynan, Iain Burnside and Christopher Jones (violin) performing works by Frank Bridge, Samuel Barber, Rebecca Clarke, Seóirse Bodley and Herbert Hughes. On the Saturday, Robin Tritschler, Adam Walker (flute), Nicholas Daniel (oboe), The Gildas Quartet and Iain Burnside perform Bax’s Oboe Quintet, George Benjamin’s Flight, Peter Warlock’s The Curlew and the world premiere of The Blackbird’s Poet by Philip Hammond. The Carice Singers directed by George Parris perform music by Bax, Delius, Grainger and Parry, whose centenary is in 2018, and on Saturday evening Fiona Shaw joins Robin Tritschler, Gareth Brynmor John, Nicholas Daniel and Iain Burnside for a sequence of words and music, by Britten, Ireland, Bliss, Thea Musgrave, Ina Boyle and Jennifer Walshe. For the closing recital on Sunday, Carolyn Dobbin, Gavan Ring and Iain Burnside perform songs by Irish composers Ina Boyle, her cousin Charles Wood, Joan Trimble, Howard Ferguson, Hamilton Harty and a new commission by Martin Bussey. Full details from the Ludlow Assembly Rooms website.